The Rev. Dr. Robert A. Smith, Jr.
A native of Augusta, Maine, Pastor Bob attended schools in Augusta, is a graduate of Aroostook State College, Presque Isle, Maine and holds a Master of Arts in Teaching from the University of Maine. He taught Social Studies at Houlton High School for 21 years. He left teaching in 1988 to attend Bangor Theological Seminary in Bangor, Maine, received a Master of Divinity in 1991 and was ordained a priest in 1991. He was called to serve the five Parishes of the Aroostook Episcopal Cluster. Pastor Bob received the degree of Doctor of Ministry in May of 1997. He was involved in diocesan youth work, served on a number of committees including the Committee on Baptismal Ministry, Bishop’s Task Force on the Mission of the Church, Bishop Search Committee, but was most active in developing the ministry of the baptized - encouraging the ministries especially of lay people. He was also active in local ecumenical groups including area ministerial associates, area shelter for the homeless, Caribou Ecumenical Food Pantry and Week of Prayer for Christian Unity. 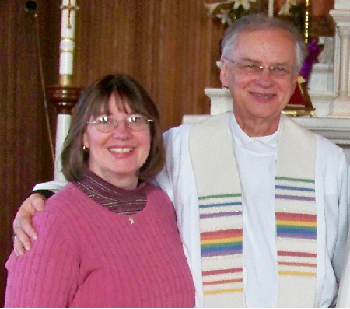 He served the people of the Episcopal Church for 21 years, retiring in August of 2012.